In Uganda, when a woman feels a lump in her breast, she often feels resigned to getting breast cancer and dying. Dr. Julie Gralow is a breast cancer specialist and a UW professor of medicine, Division of Oncology. She said one of her students, who is in the UW global health certificate program, surveyed women coming into a Ugandan clinic for non-cancer issues. The student found that none knew a single cancer survivor and none thought you could survive cancer. But there is a movement of cancer survivors in Uganda who want women to know they can survive. The Women’s Empowerment Cancer Advocacy Network (WE CAN), founded by Gralow, is now active in East Africa. WE CAN brings together survivors, leading advocates, scientists and policy makers to provide information on breast and cervical cancer and share ideas on advocacy. This year, the three-day WE CAN East Africa summit will be held in Tanzania Sept. 11-13 with representatives from 10 countries. Local involvement in cancer efforts in Uganda began in 2003, when infectious disease specialists at the Fred Hutchinson Cancer Research Center started working with the Uganda Cancer Institute on infection-related cancers. As part of this collaboration, oncology fellows from Uganda would come to Seattle for a year of training. During these visits, Gralow said, the fellows asked to know more about breast and cervical cancer, the two most common cancers in Ugandan women. 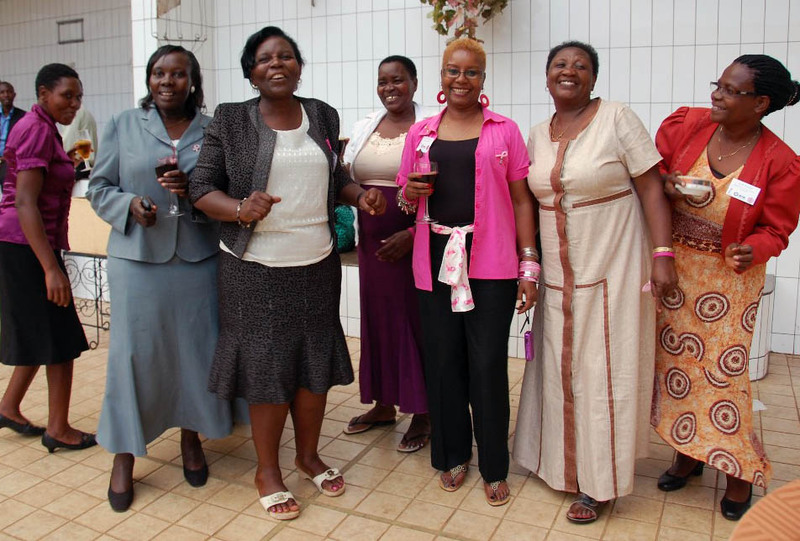 Dr. Julie Gralow (center in pink) with women in East Africa supporting cancer advocates. Gralow mentored Ugandan fellows in her breast cancer clinic at the Seattle Cancer Care Allaince, and then was invited to Uganda for a conference and series of lectures. The volunteers wanted Gralow’s help to strengthen advocacy efforts, much like WE CAN did in Eastern Europe and Central Asia as an outgrowth of a breast cancer support project that PATH started in 1997 with funding from USAID. Since 2003, WE CAN Summits have been held in Ukraine, Lithuania, Belarus, Kyrgyzstan and Georgia. The Uganda volunteers requested a summit on their continent. The first WE CAN summit in Africa was held in Uganda in 2013. Patient advocates from 10 countries participated. It was so popular, the cancer survivors asked for a yearly conference..Gralow’s team is working with local advocates to secure funding to support a local staff member to keep the flow of information going between the countries. WE CAN has also teamed up with Emmy-award winning journalist Penny Legate to capture the stories of cancer survivors and produce a video for advocates c to spread the word about survivorship. Simply knowing cancer is survivable is a major step in saving lives. Rather than promoting mammography in settings where lack of access is a barrier, Gralow said health care workers taught how to perform a thorough breast exam, They also let women know that the survival is higher among women who i come into the clinicwhen they find a lump. As for cervical cancer, she said, there is a strong promotion of visual inspection by putting vinegar on the cervix and looking forwhite spots that might be pre-cancerous lesions. Also, she said, there is a big push for the human papillomavirus, or HPV, vaccine to lower cervical cancer risk, which has been heavily discounted in lower income countries. “These cancer survivors who are leading these support groups are just phenomenal,” said Gralow. “They don’t need to do this. They are trying to help others in their own countries, which have very little in the way of resources or health care access, which makes you evaluate and appreciate everything we have in Seattle, and in the U.S."